This press release contains forward-looking statements that involve risks and uncertainties, as well as assumptions that if they materialize or prove incorrect, could cause the results of CEVA to differ materially from those expressed or implied by such forward-looking statements and assumptions. 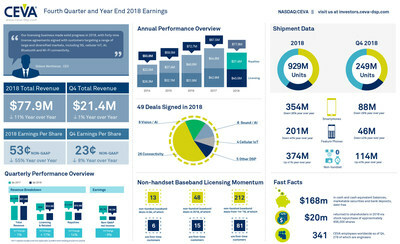 Forward-looking statements include Mr. Wertheizer's statements about CEVA's licensing agreements forming the foundation for significant market share expansion and royalty revenue growth in the coming years, the elevated inventories in handsets to add to the usual seasonal weakness in near-term royalties, expectation of continued expansion at our non-handset and base station customers, along with a recovery in handsets in the later part of the year, as well as the belief that CEVA is on track to more than double its royalty revenue business in 2022. The risks, uncertainties and assumptions that could cause differing CEVA results include: the ability of the CEVA DSP cores and other technologies to continue to be strong growth drivers for us; our success in penetrating new markets, including in non-baseband markets, and maintaining our market position in existing markets; our ability to diversify the company's royalty streams, the ability of products incorporating our technologies to achieve market acceptance, the speed and extent of the expansion of the 4G, 5G and LTE networks, the maturation of the IoT market, the effect of intense industry competition and consolidation, global chip market trends, the possibility that markets for CEVA's technologies may not develop as expected or that products incorporating our technologies do not achieve market acceptance; our ability to timely and successfully develop and introduce new technologies; and general market conditions and other risks relating to our business, including, but not limited to, those that are described from time to time in our SEC filings. CEVA assumes no obligation to update any forward-looking statements or information, which speak as of their respective dates.